While last week saw the launch of BlackBerry 10, the majority of BlackBerry users are still on the classic BlackBerry operating system. The distribution of operating system versions is almost completely unchanged from where it was in December. With users of higher end devices more likely to able to afford to upgrade to BlackBerry 10 there is even the possibility that the percentage of users on OS 6 and 7 may actually even go down in the coming months. This data was taken from downloads of the free BlackBerry strategy game Pixelated. 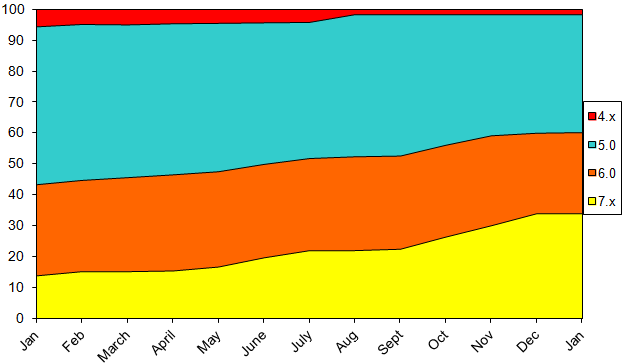 Data shown on the chart is from the beginning of January 2012 through the end of January 2013.